The Red Sox are one of the several teams looking into trading for Baltimore Orioles closer Zach Britton, according to Nick Cafardo of The Boston Globe. The two-time All-Star began his career as a starter, but moved to the bullpen in 2014 after three consecutive seasons with an ERA over 4.61. Britton has a 1.71 ERA and 1.024 WHIP since becoming a full-time bullpen pitcher. The southpaw’s best season came in 2016 when he came in fourth place for the American League Cy Young Award voting. In 2016 Britton reached career highs in saves and games finished, finishing 63 of his 69 games while getting 47 saves. What’s most impressive is Britton’s 0.54 ERA and 0.386 WHIP which earned him the AL Mariano Rivera Reliever of the Year Award. Since 2016 Britton struggled with injuries. He missed almost three months of the 2017 season with a forearm strain on his pitching arm and put up a 2.89 ERA throughout 37.1 innings. Britton also started 2018 on the disabled list after needing surgery on a ruptured achilles. Since his activation in early June, Britton only made eight appearances, but has given up six runs during his 6.2 innings, giving him a 7.04 ERA with a 1.830 WHIP. Another big concern is Britton’s velocity. His velocity on both his sinker and curveball have dropped quite a bit since his 2016 season. Britton’s sinker had an average velocity of 96.9 mph in 2016 and it has now dropped to a 93.8 mph pitch. His curveball has also decreased in velocity, now averaging 79.5 mph instead of the 82.7 mph he averaged just two years earlier. The Orioles are likely to be trading away their best players before the trade deadline, as most of them will be entering free agency at the end of this season. This puts Britton on the table as he is also entering free agency after this season. Baltimore would most likely want young talent for Britton, as they are in last place for team batting average, fourth lowest in team OPS and fourth highest in ERA throughout the Majors and most of their best players entering free agency. With a lack of high-level prospects obtaining Britton may be difficult unless Dave Dombrowski would be willing to give up the team’s top prospects or Rafael Devers. 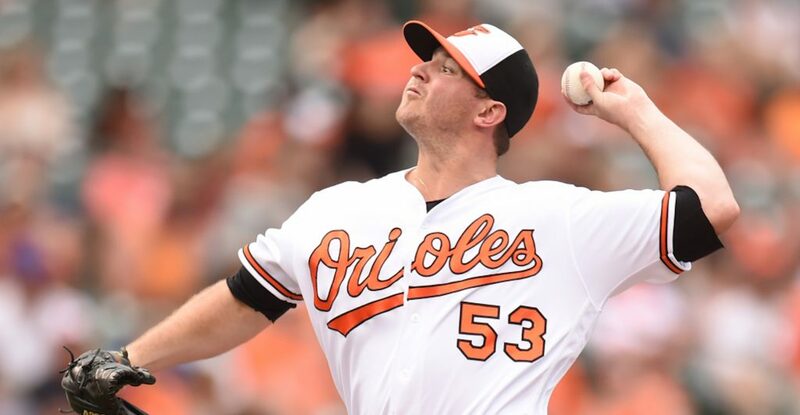 If obtained by the Red Sox, Britton would most likely become the setup man for the team’s current closer Craig Kimbrel, but his current struggles in the bullpen may keep him from reaching Boston altogether. If Britton can return to his All-Star state he would be a valuable asset to the Red Sox bullpen.